With the advent of mobile technology, the interface in which the clinician can view medical imaging and electronic records is more accessible than ever1Citrix. Making the iPad work for healthcare. In: Inc CS, editor. Fort Lauterdale, USA2010.. The Citrix Receiver™ provides a secure platform for clinicians to access a virtual desktop, linked to the hospital server, via their mobile tablet device or laptop computer. This technology was born out of the need for mobile offices dedicated for the clinician, and has since been adopted by medical professionals in many centres as a means for offsite access to hospital electronic medical records (EMR). With the nascent boom of health informatics and ‘tele-medicine’ due to the birth of mobile devices, we are continuously in the pursuit towards improving the efficacy and timeliness of healthcare delivery as well as ensuring patient safety. Citrix ReceiverTM is but one example and it is currently in use amongst the Orthopaedic registrars at the Austin Hospital in metropolitan Melbourne, Victoria. The Citrix Receiver™ is a user-friendly client software that is installed on a portable device, which provides a secure, encrypted connection between the clinician and the hospital server to provide remote access to a “virtual desktop”. This allows hospital documents and applications to be securely accessed from a mobile tablet device (iPad or android) or laptop computer (PC or Mac). Therefore, the Citrix Receiver™ provides virtual access to the hospital’s network. 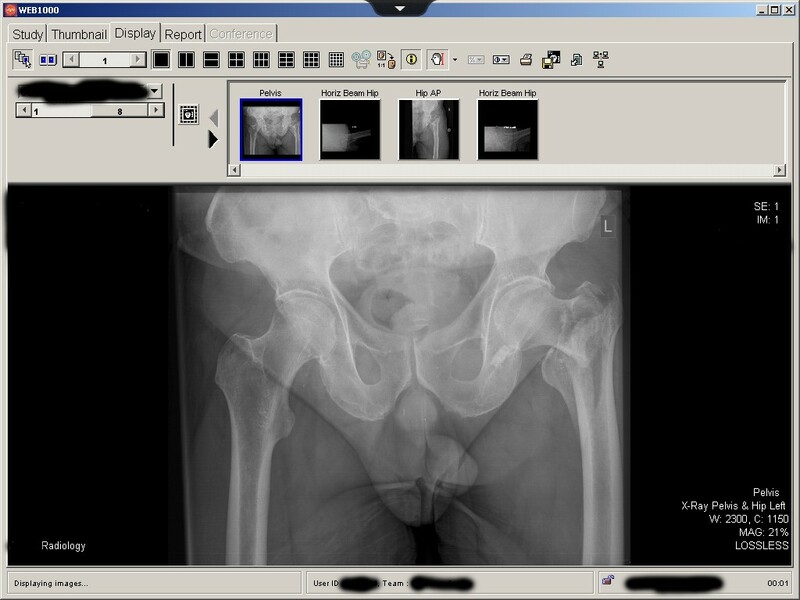 The Hospital Administrators and Information Technology Departments control the content of this virtual desktop, including links to the medical imaging software (New AGFA Web 1000™) and Scanned Medical Records in addition to access to the hospital intranet. 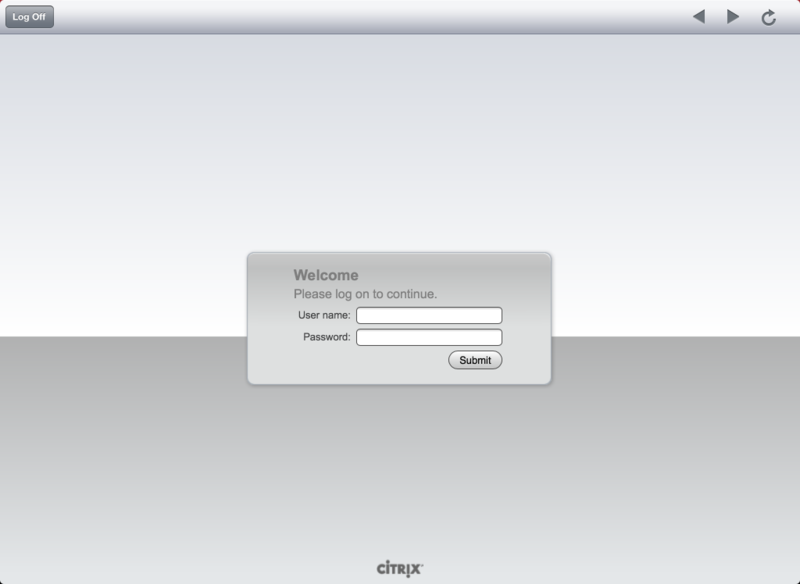 Once a clinician has received clearance for access from their administrator, one simply downloads the Citrix Receiver™ from the product website (http://www.citrix.com/English/ss/downloads/index.asp) or relevant tablet application download site (e.g. iTunes, 13.6 megabytes). On first log-in, the clinician must enter in the unique account settings including: address of the host server; username and password; and domain name. The clinician’s individualized hospital log-in details would then allow access to the virtual desktop, granting use of scanned medical records and other useful accompanying features (Figure 1). There are few issues with compatibility as the applications are loaded and run via secure, centrally located server, which is the hospital server itself, and not through the user’s mobile device. The convenience of using mobile technology to access medical records and imaging cannot be denied. A recent cross-sectional survey by physicians in North America elucidated that the increasing use of mobile technology amongst specialty physicians was a predictor of career satisfaction2Elder KT, Wiltshire JC, Rooks RN, Belue R, Gary LC. Health information technology and physician career satisfaction. Perspect Health Inf Manag. 2010;7.. 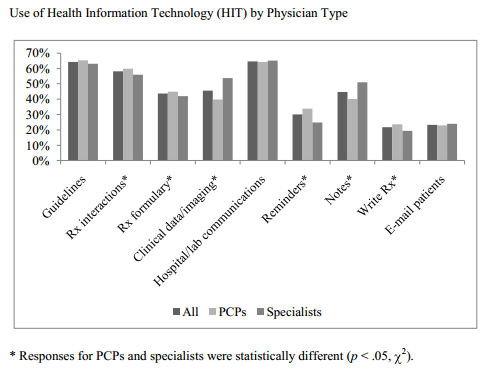 This can be further extrapolated by the uses of health information technology (HIT) in the figure below (Figure 2- taken from the same study), as various means of complementing the clinician’s practice. With the advent of Multimedia Messaging Services (MMS) on mobile phones, where images can be shared using mobile-to-mobile phone technology, the Citrix Receiver™ for iPad proves its superiority with a larger screen and higher resolution5Butcher L. Technology. Will iPads lead to a technology arms race? Hosp Health Netw. 2010 Mar;84(3):20.. Nevertheless, a recent study by Padmasekara et al. examining the reliability of MMS compared to the standard computer monitor for the decision making of distal radial fractures have revealed no significant difference between the two modalities6Padmasekara G, Nazarian D, Wall C. The reliability of mobile multimedia messaging (MMS) for decision making in distal radius fractures: An effective alternative. The Journal of Mobile Technology in Medicine. 2012;1(1):8-12.. Studies similar to this are a testament to the utility of mobile devices such as the iPad in tele-radiology. Even when a clinician is onsite at their hospital, access to the Citrix Receiver™ via a tablet device provides quick, mobile and easy access to electronic patient records7Cockerham M. Use of a tablet personal computer to enhance patient care on multidisciplinary rounds. Am J Health Syst Pharm. 2009 Nov 1;66(21):1909-11.. This is particularly useful on daily ward rounds and the concomitant laborious tasks such as reviewing pre- and post-operative imaging and checking recent blood test results. Overseas, the Louisiana State University Health Sciences Centre (a large tertiary hospital) has piloted the use of personal digital assistants (PDA) in their oncology ward rounds to aid in their ward rounds. Their experience is a positive one in that the use of PDAs has reduced their clinical workload as well as ensuring evidenced-based care and patient safety through the ready-access of pharmaceutical guidelines and patient blood results. In our experience, the use of Citrix ReceiverTM expedites the whole ward-round process in order to decide on a management plan early in the day. This is particularly pertinent in areas of the hospital (e.g. operating suite, wards, doctors’ office) where there is a shortage of desktop computers to access records. Wherever mobile technology is used to access confidential records, maintaining security of those records are of utmost priority8Pharow P, Blobel B. Mobile health requires mobile security: challenges, solutions, and standardization. Stud Health Technol Inform. 2008;136:697-702.,9Savastano M, Hovsto A, Pharow P, Blobel B. Identity-management factors in e-health and telemedicine applications. J Telemed Telecare. 2008;14(7):386-8.. Patient confidentiality is maintained by password access to the applications on the Citrix Receiver™ desktop. A secure network is utilized. The automatic lockout time from an idle application is approximately five minutes, which is useful in the case of forgetting to close applications, but this can also be frustrating when using the application for other complex purposes such as preparing for multi-disciplinary meetings and case reviews. Furthermore, an added level of security is ensured in that a unit administrator must approve for a staff member to have remote access to the server. The Citrix Receiver™ application can be onerous at times. In our experience, the loading time of various applications can vary significantly to the extent that the system would log the user offline. This phenomenon has been anecdotally tested on several mobile devices as well as computers and the problem appears in all of them. This may reflect problems with the hospital server, network or hardware. Other common errors include the screen spontaneously turning to black when using the application on the iPhone as well as network connection failures with the iPad. Furthermore, the use of Citrix Receiver™ requires the purchase of a personal mobile device, which is not funded by the hospital. Therefore, the clinician has to pay for the convenience of having remote access to a personal tablet or laptop computer and for the internet connection. These costs may be mitigated by the ability to claim these costs on the annual tax return. It could be postulated that remote access to records and imaging could actually result in patient harm. By developing a treatment plan over the phone, based solely on imaging and a verbal report from a non-specialty doctor, the Orthopaedic registrar runs the risk of becoming a “radiologist” – basing decision making on imaging and not clinical assessment. In addition, these “radiological-based decisions” are often made in the middle of the night, with the registrar not fully alert. The natural corollary to this is a sub-optimal clinical decision that may lead to patient harm3Bradley WG, Jr. Off-site teleradiology: the pros. Radiology. 2008 Aug;248(2):337-41..
Also, one could argue that by having remote access to imaging and blood test results, an expectation could form that the clinician should and will be checking the results at home, after the working day. So conversely, this application, which is designed to facilitate work/life balance, has the potential to have a paradoxical negative effect on that very balance. The Citrix Receiver™ for mobile tablet devices and laptop computers provides secure, remote access to a virtual desktop linked to the hospital server. The convenience of accessing work applications from anywhere cannot be denied, however it has the potential to blur the lines between work and home life. For the on-call registrar, it is a vital tool when receiving referrals without the need to be physically present at hospital. Although the occasional technical malfunction does occur, this application is easy to download and use. Overall, the Citrix Receiver™ provides a useful and meaningful adjunct to clinical medicine and surgery. 1. Citrix. Making the iPad work for healthcare. In: Inc CS, editor. Fort Lauterdale, USA2010. 2. Elder KT, Wiltshire JC, Rooks RN, Belue R, Gary LC. Health information technology and physician career satisfaction. Perspect Health Inf Manag. 2010;7. 3. Bradley WG, Jr. Off-site teleradiology: the pros. Radiology. 2008 Aug;248(2):337-41. 4. Wachter RM. The “dis-location” of U.S. medicine–the implications of medical outsourcing. N Engl J Med. 2006 Feb 16;354(7):661-5. 5. Butcher L. Technology. Will iPads lead to a technology arms race? Hosp Health Netw. 2010 Mar;84(3):20. 6. Padmasekara G, Nazarian D, Wall C. The reliability of mobile multimedia messaging (MMS) for decision making in distal radius fractures: An effective alternative. The Journal of Mobile Technology in Medicine. 2012;1(1):8-12. 7. Cockerham M. Use of a tablet personal computer to enhance patient care on multidisciplinary rounds. Am J Health Syst Pharm. 2009 Nov 1;66(21):1909-11. 8. Pharow P, Blobel B. Mobile health requires mobile security: challenges, solutions, and standardization. Stud Health Technol Inform. 2008;136:697-702. 9. Savastano M, Hovsto A, Pharow P, Blobel B. Identity-management factors in e-health and telemedicine applications. J Telemed Telecare. 2008;14(7):386-8.